Pinewood Inc's. Confidential Document Destruction program reached a significant milestone on it's 10th anniversary, having shredded an impressive one-million pounds of paper since it's inception in 2004. We are committed to providing an environmentally friendly, cost effective solution to the needs of our business customers while providing opportunities for employment and independence to the people we serve. Pinewood would like to especially thank our community members for helping us to make this extraordinary achievement possible. Thank you! Since 2005, courageous Pinewood Inc. current and past employees have been jumping into the frigid waters of Lake Superior to benefit Special Olympics Minnesota. In 2016 we raised over $2,500.00 for the cause, surpassing our 2014 record of $2,200! Our group also attempted to repeat as winners of the "best costume" award by dressing as hillbillies, but were edged out by some terrific competition. Don't forget to come and cheer us on in 2017! Listen in as Glenn and Andrew sing the title track to their new CD "Landsharks Forever". Andrew began working as Glenn's PCA years ago, but their relationship soon developed into a true friendship and the two formed a band called "Shark Boys". They have since put together two CDs and many of their songs can be heard on YouTube. Congratulations Glenn and Andrew on your music and lasting friendship! 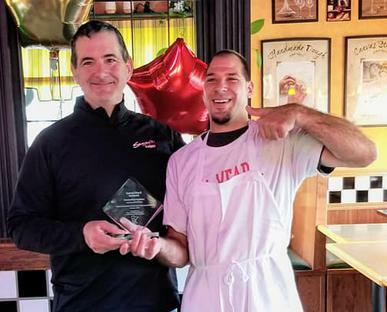 Sammy's Pizza Owner Wins 2018 MOHR Outstanding Disability Employer Award! 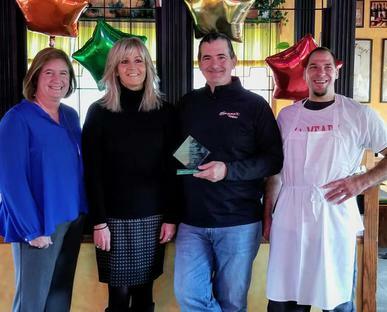 Mike Acheson, owner of Sammy's Pizza in Cloquet, received the 2018 MOHR Outstanding Disability Employer Award on Tuesday, October 16th, in recognition of National Disability Employment Awareness Month. Danae Lambert of Pinewood nominated Mike for the award because he has consistently gone above and beyond the duties of an employer since he began hiring his employees from Pinewood, even going so far as to provide transportation to and from work for them when needed. Mike is actively involved in the lives of his employees, not only during working hours, but during their time-off as well. He includes them in family activities and provides community opportunities and experiences that otherwise may not be available to them. Mike opened Sammy's Pizza in Cloquet in 2000. A few years later, he began hiring people with disabilities through Pinewood. He has employed several Pinewood employees for as many as 15 years and has photos of him and the employees dating back to 2004. What began as an effort to cover 14 dishwasher shifts a week turned into something far more rewarding, Mike said. “They have become a part of this place, and a huge part of my life. I will continue to do this as long as I am alive." Pinewood is extremely proud to partner with Sammy's Pizza in helping to provide customized employment opportunities to individuals with disabilities. A very sincere congratulations Mike!